Herbs galore – now what to do with them?! Several weeks ago I planted some very small herb plants, and the combination of April showers and quite a bit of sunshine with mild to warm weather since then has led to them exploding. Most of them have now reached the stage where they can be used liberally in cooking, and it’s fantastically rewarding, I find, to have all these fresh flavours so readily available throughout the summer. 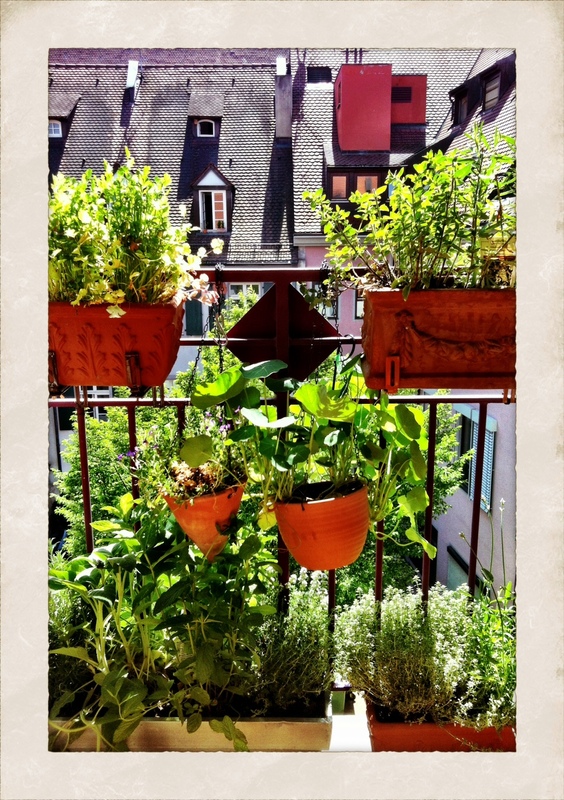 The picture shows just what’s outside the french windows in the living room – at the top there’s coriander (l), oregano and tarragon (r), in the hanging pots there’s an aubretia (just for decoration – not planning on eating it!) and a nasturtium (now with a stonking orange flower), then at the bottom there’s a jungle of (l-r) rosemary, sage, Moroccan mint, thyme, lemon thyme and lavender. Upstairs on the roof terrace outside the landing window there’s more lavender, parsley, lemongrass, strawberry mint, Thai basil and some (still very small, grown by M from seed) chilli plants. I adore sage and use it relatively frequently with pork, and it also combines well with olive oil, garlic and parmesan to make a simple pasta sauce or (in greater concentration) pesto. I also love sage tea, though I have a very big pack of dried sage bought during the winter that I’m ploughing through for that purpose. The “problem” this year is that the sage plant has already grown to be absolutely mahoosive, with the biggest leaves I’ve ever seen on such a plant. And for that reason I’d like to extend my repertoire of dishes that call for it. What shall I do with all this (lemon) thyme on my hands? M is a big fan of lemon thyme, and I have to say that whatever he cooks with it does indeed taste very good. However, my preference is clearly for the more ordinary variety – if I want something to taste lemony, then I’ll put some lemon juice or zest in it. However, maybe someone out there knows of a dish (or a drink or other use – it doesn’t have to be “food” per se) where lemon thyme works really well and has a definite advantage over its more down-to-earth relative. Anyone got recipes that are worth a mint? This is where my German friends are expected to say “But you eat mint sauce with everything, don’t you?” and I roll my eyes skywards and grimace. Asterix has a lot to answer for! In actual fact, I really went off mint at some point after childhood, and it’s only now that I’m really appreciating it. Yes, it IS good with lamb, and I use it a lot in Indian cooking (various curry sauces and raita) and Middle Eastern / North African dishes (e.g. tabboulé). However, that still seems a bit of a narrow palette and I’d be glad if I could extend it somewhat. Tea made out of fresh mint is also delicious – I sometimes also mix it with fresh root ginger for a really zingy drink – but I’m looking for more strictly food-based ideas in this case. Why are there no bad puns on “oregano”? Oregano seems to be another of those staples everyone has in their herb and spice rack, but I can’t claim ever to have done anything very memorable with it. I tend to use it mostly in combination with other herbs, sometimes in salads or with Italian and Greek food. It really doesn’t have a strong profile with me, though. I’d be really delighted to receive some tips and tricks for the herbs I’m a bit stuck on, and indeed on any of the others mentioned. And now I’m off to cook a curry!